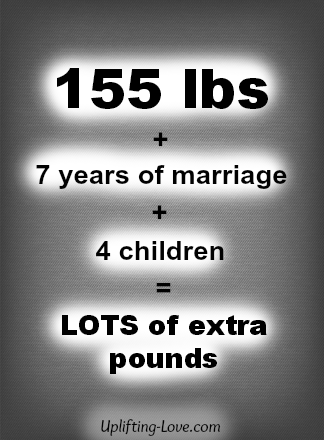 That's what I weighed when Cami and I were married. I was a roofer at the time and working between 10 and 12 hours a day with the occasional 15 hour day. All of which was hard manual labor. I also possessed some very toned muscles at the time (which Cami "appreciated" a lot). At the end of that summer we went back to school for our senior year of college. I did a lot of sitting, reading, and studying. We did have an early morning jogging class together though. That was fun. The next spring we found out that we were expecting our first child. Cami lost something like 10-15 pounds right off the bat (and she was already pretty skinny). As the pregnancy progressed, and she "craved" chocolate milkshakes (I still think this was an awfully convenient craving), her belly grew and, as expected, she gained a few pounds. After our first son was born she was a few pounds heavier than before the pregnancy. This was no surprise and, as is common for many women, she lost the extra weight in a couple of months thanks to breastfeeding. I, however, realized that I had also picked up a few additional pounds and they were still hanging around. "Don't worry about it" I thought. "They'll go away. You have a high metabolism" I told myself. Over the next few years I found myself repeating this often. Guess what? While Cami continued to return to her prepregnancy weight after each child, I didn't. About a year and a half ago I finally hit my peak. 220 pounds. Yep, I had gained weight at a rate of about 12 pounds a year since our wedding. I did the math and was surprised that if I continued without making changes to my lifestyle I would weigh 275 pounds by our 10th anniversary and almost 400 pounds by our 20th anniversary. That simply wouldn't do. My first decision was to begin going on daily early morning walks. This gave me a chance to get a little bit of exercise, enjoy the outdoors, and time to think (which I enjoy doing). I figured that after a couple of months I would have lost maybe 10 pounds. Nope. Not a one. Next I decided to cut back, ever so slightly, my food consumption. I mean, would I really struggle to eat one less brownie each week? I didn't lose any weight but at this point, with the walking and slight decrease in the amount I ate, I stopped gaining weight. This lasted for about a year. Then in May I asked my brother-in-law if he would teach me how to work out and help me get back into shape. He's a great guy and agreed to help so on the first of June I met him at the weight room at the local college. That first week was torture! I was sore and exhausted and that Saturday my arms and joints hurt so badly that I just sat around whining all day long. Cami wasn't very impressed. After that it got easier, well I wasn't as sore anyway. We worked out every weekday morning in June, July, and August. I was dedicated. I felt better and the fact that I was getting physically stronger was evident. But...still no weight loss. At this point I was feeling pretty discouraged/frustrated. I was lifting weights every day and running twice a week. We ran further and faster than I had run in at least a decade. What was going on? I kept at it because, well, what else could I do? Then, about a month ago, I hopped on the scale. I looked down, as I had done literally a hundred times before, and waited for the depressing, same result: 220 pounds. To my surprise and utter disbelief the scale said 218. What!?!? I redoubled my efforts at this point hoping it wasn't just a fluke. I didn't weigh myself for a few days for fear of being disappointed. You might know the feeling. The next time I hopped on the scale I was filled with anxious anticipation. I felt like a kid waking up the day after he lost a tooth hoping that the tooth fairy had come. She had!! The scale said 217! I was actually losing weight! After months of effort and self-deprivation (okay, it wasn't that bad just a baked good passed up here and there) I was finally winning! Since then I have continued to lose weight. To aid in the effort, and to accelerate it, I downloaded an app on my phone to track my calorie consumption and set the daily limit to 1,500 (that has been HARD). I am losing between 2 and 3 pounds a week now. It's great! Another two months of this and I should be where I want to be: 180 pounds. Cami has encouraged me to chronicle my "journey" here on the blog. I've tried to think of a catchy title like "weight loss Wednesday" or "fit Friday" or "miserable Monday" (I think this one is funny) but haven't come up with anything. Therefore, I'm going to go the traditional (and boring route) and call my updates "Weight Loss Updates". If you have a better name (and I'm sure you will) please let me know. I really do need something more clever and catchy. By the way, the secret to my success thus far: persistence. I look forward to reading your suggestions in the comments. Wish me luck! I agree...it is hard and frustrating not to see instant results...but how you feel should be telling you something and it's great that you're sticking with it! I haven't lost a ton of weight so far, just a bit here and there since cleaning up my eating (with the exception of the clearance halloween candy, oops), but overall I just feel so much better! We tend to under estimate what we eat. A good means of tracking the quantity of food, choosing good quality foods, such as eating only from the outside edge of the grocery store, staying away from the processed foods in the middle aisles, eating produce, meats, fish, and dairy from the perimeter, and some regular exercise and the pounds fall off. There are some other tricks. Often we eat when we are really thirsty. Drink more water. I try to drink my 28-30oz water bottle 3x each day. That's the 8+ glasses of water we need. If you don't have the app, then use some good approximations. Meats, don't eat any more than the size of the palm of your hand. There is your serving. For me, at 5'11" and 220, 49" chest, 36" waist, a 6oz sirloin just fits in the palm of my hand without touching my fingers. Have some mixed veggies, maybe a potato if I've done 30+ miles on my bicycle that day. Some fresh fruit for dessert. A single Oreo cookie is 50 calories. Who really eats only one? It's easy for calorie dense foods to fool you. Also, low fat, no fat doesn't mean it's healthy. After all, a bag of sugar has ZERO fat grams. Besides, you need certain fats for your body to function properly. So for me, my 300-400 calorie breakfast is 3 slices of center cut bacon, a 3 egg white omelette with peppers, onions, mushrooms and maybe an oz of smoked gouda cheese. I have the fresh fruit at 4:30am before I head to the gym to get my system started, and have the first water bottle with the workout. Again, if I rode my bike on a Saturday or holiday, I might treat myself to 1/2 a bagel. The same 300-400 calories that someone consumes in a bagel or other sugary breakfast product, I can have the bacon (center cut is lower fat) eggs/egg whites, fruits, veggies and cheese. The last thing is plan for your snacks. I carry almonds or other nuts to snack on between breakfast and lunch or lunch and dinner. It's better to have one or two servings of that than hitting up the vending machine or c-store for some processed garbage. It's about making a plan, a good plan, executing and monitoring your adherence to the plan. Can't just live for your passions. Your body wants to tell you to store all the fat, we might starve to death. I lost the first 30 of my 50 pound total loss by simply changing my eating habits. The last 20 came when I added more vigorous exercise and tracked that too with a heart rate monitoring app that reported what I was really doing. Now I can ride 30+ miles on my bike in about 2 hours. Going for 100 miles in a day by the end of this summer.